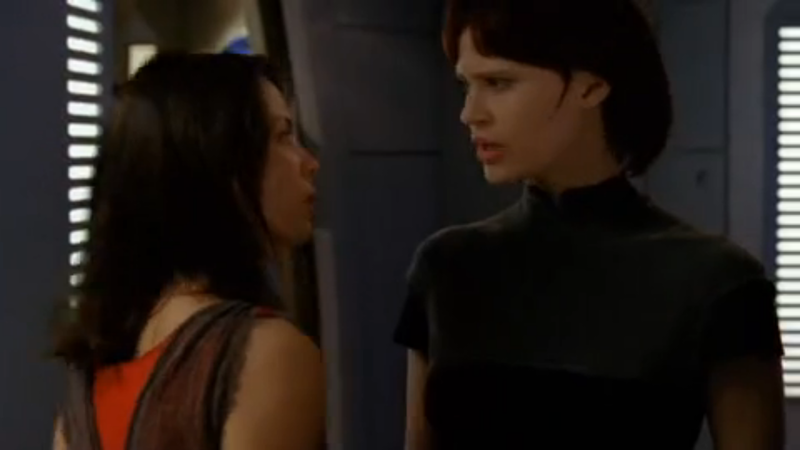 It’s not uncommon, especially in sci-fi shows, to see the same actors cropping up from program to program. Many of the shows are shot in the same area, often at the same time in different parts of the city (usually Vancouver), so it’s not terribly uncommon to see actors from one show with small roles on another. This goes double for actors from shows that have ended, and that tends to lead to some odd trends emerging. Here are four strange casting situations that arose from all these shows and movies drawing from the same actor pool. Would Sarah Connor wave guns around so freely? Wait. Don’t answer that. Spoilers for the Defiance season 2 finale! 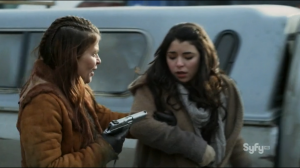 As viewers of Defiance know, the long-missing wife of Rafe McCawley reappeared in the last few episodes, played by sci-fi icon Linda Hamilton of Terminator fame. In those movies, she’s Sarah Connor, mother of mankind’s savior John Connor and frequent target of SkyNet. As such, she’s often on the run across the country, child in tow. We know she’s the hero, but from an outside perspective, like the one we occasionally get in The Sarah Connor Chronicles, Sarah must look like a raving lunatic, talking about how robots from the future have come to kill her and her kid. So when Pilar McCawley shows up, what do we learn? Well, that she was a raving lunatic, who immediately proceeds to kidnap her daughter and drag them off across the country (with her son an accomplice to boot). 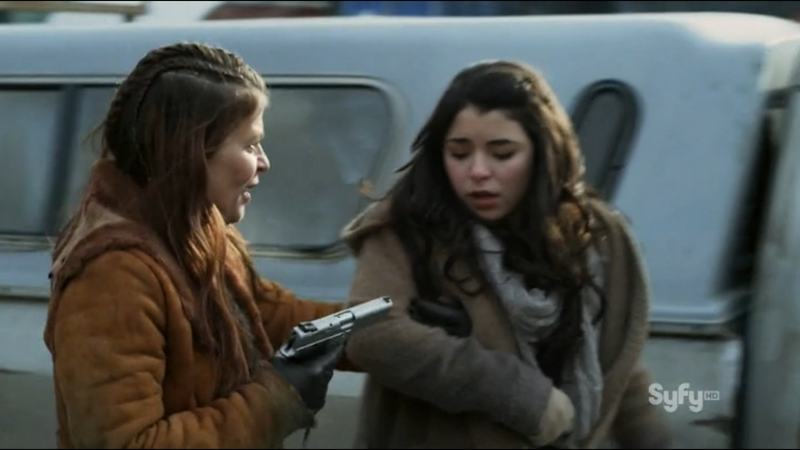 Whatever motive she has for these actions has not yet been revealed, and it’s entirely possible that season 3 of Defiance will come forward with a legit explanation–after all, they went to the trouble of casting Linda Hamilton in the role, there’s gotta be something to it. Who knows? Maybe there’s more than a surface-level similarity behind this. Of course, you can always just pretend this is Q screwing around. For a more conventional example, we’ll turn to Stargate, the third-longest running sci-fi series in terms of raw hours of footage, right behind Star Trek and Doctor Who. 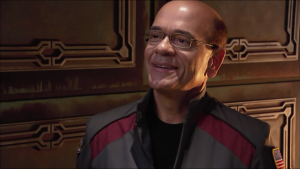 SG-1 ran concurrently with Trek for a long time, and characters like O’Neill were even fans of Trek in-universe. So you’d think they might have started to notice a pattern when, on their missions, the people tended to look a lot like the actors behind their favorite characters. Rene Auberjonois (Odo) plays a racist military leader whom SG-1 initially helps until they find out he’s space Hitler. Connor Trinneer (Trip) plays Michael, a Wraith/Human hybrid on Atlantis who troubles the team numerous times. 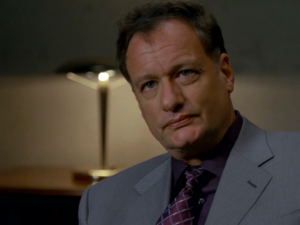 John De Lancie (Q) plays Colonel Frank Simmons, an NID agent who hassles SG-1 constantly. De Lancie also made it into the Who universe via Torchwood, giving him the TV sci-fi hat trick. Colm Meaney (O’Brien) plays Cowen, a fascist military leader of the Genii on Atlantis, one of the few human enemies in Pegasus. Dwight Schultz (Barclay) plays “The Keeper,” a one-off villain who held SG-1 in a simulation against their will. 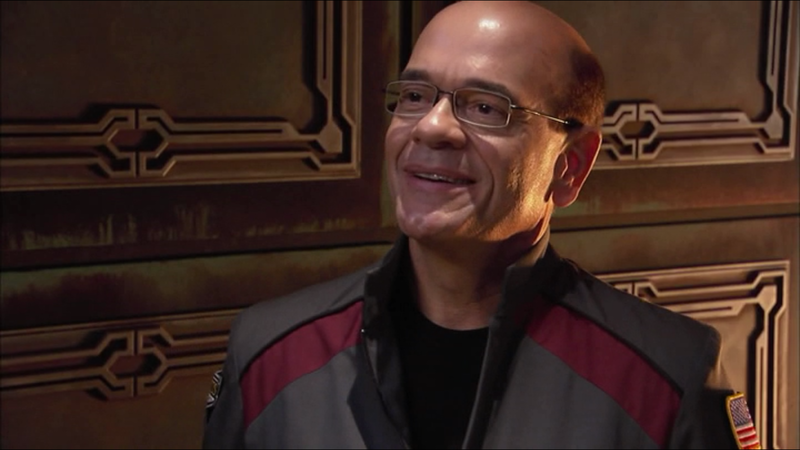 Robert Picardo (The Doctor) plays Richard Woolsey, who starts off as an antagonist to SG-1 until finally becoming a sympathetic main character in Atlantis‘s last season. Ronny Cox (Jellico from “Chain of Command”) plays jerk politician Kinsey, although Kinsey was a much larger role than Jellico was. There are only a handful of exceptions, with Marina Sirtis (Troi) playing a borderline example, and Jolene Blalock (T’Pol) and Nicole de Boer (Ezri Dax) as the two legitimate good guys (the former an ally/love interest for Teal’c, the latter a one-off doctor on Atlantis). You might note the gender disparity here; the only male actor to play a good guy is John Billingsley (Phlox), and that’s mostly because he’s comic relief in both shows. How much Time Lord is in the mix at this point? No telling. Doctor Who has a huge universe, so you’d expect there to be a lot of this going on. In Doctor Who series 4, there’s an episode called “The Doctor’s Daughter.” In it, Jenny, a female clone of the Doctor, is created by an army of soldiers made up entire of clones. She’s the eponymous “Doctor’s Daughter,” as she’s the closest thing to another Time Lord he’s met in a while. But you see, where it gets interesting is that Jenny is played by one Georgia Moffett, who just so happens to be the daughter of Peter Davison, the actor who portrayed the Fifth Doctor. Ergo, she was both in reality and in the show the daughter of (a) Doctor. It gets even more amusing when she and David Tennant became romantically involved, and finally married. They later went onto have a child, thus making it possible for the daughter of one Doctor to give birth to the daughter of another Doctor. If that’s not deliciously timey-wimey enough to only happen to people involved with Doctor Who, I don’t know what is. This is one of my favorites, probably because I’m the only person on Earth to have watched both of these things. Andromeda, as I’ve mentioned a few times before, was one of the first shows I watched week-to-week that wasn’t aimed primarily at kids, so I’m kind of attached to it. In that show, there’s an android, Rommie, played by Lexa Doig, and the rough and tumble ship captain Beka Valentine, played by Lisa Ryder. Rommie, as an android, is particularly tough and durable, which gives her a lot of cool scenes, but most of the time it’s Beka who takes the lead female role. So that’s 4 casting situations that I found to be fairly amusing for well-versed sci-fi fans. Are there any other casting coincidences like these that you’re aware of? Let me know in the comments, or on Twitter @RetroPhaseShift. Great article, especially the section about why these Trek fans in Stargate don’t recognize all those people! In the show called Doctor Who there was an episode called The Doctor’s Daughter. Who, in that story the tenth Doctor, had a hottie daughter. The actress who played the tenth Doctor’s daughter, in real life married the tenth Doctor actor. And the Doctor’s daughter actress was herself the daughter of the actor who had played the fifth Doctor. then in real life married the tenth Doctor actor. even though the two Doctor actors are playing the same Doctor… Who! Well, I can honestly say no one has left poetry in the comments before! Haha. Glad you enjoyed the article.